This post is a shortened version of an article that I wrote, ‘Barrigone Holy Well and the Crimean War: An unlikely Connection’, published back in 2016 in the North Munster Antiquarian Journal . The article details a little known the story of the mother of a young man from West Limerick. who went to fight in the Crimean war and the rituals she carried out at Barrigone Holy Well, in the townland of Craggs, to petition God for his protection. 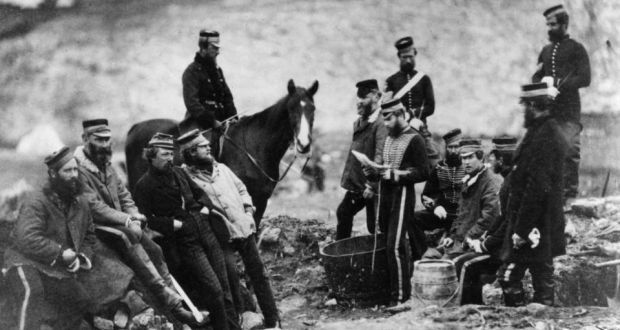 The Crimean war took place between 1854-6 and was fought on the Crimean peninsula. It was fought between Russia and an alliance of Britain, France and the Ottoman Turkish empire. Irish soldiers made up around 30–35 per cent of the British army in 1854, and it is estimated that over 30,000 Irish soldiers served in the Crimea War. Approximately 7,000 Irish men died during the war. David Murphy has a very readable and interesting book called Ireland and the Crimean War which details the war and Irish involvement. In 1855, at the height the Crimean war, a letter entitled ‘The Way to Save Lives in the Crimea’ was sent to The Catholic Layman Magazine. The letter was written by one Humphrey O’Leary who recounts his interaction with the mother of the soldier fighting in Crimea mentioned above. The woman, who was illiterate, wished Leary to write down her words in a letter to her son. She also wanted to provide instruction for the use of a small number of stones taken from the holy well at Barrigone, that were to be sent with the letter. Unfortunately the names of the mother or son are not mentioned and this was most likely deliberately done as Leary is sharing their stories in a very public venue. Its clear from his writing that Leary was a middle class Catholic and had advantages not available to the soldier woman including an education who is of a lower social standing. Apart from detailing the story of the woman and her son, the letter also provides an insight in life in nineteenth century Ireland, changing attitudes to pilgrimage within the Catholic population and the poor levels of literary. Leary tells us the woman’s son was ‘fighting with the Rooshins in Sebastable [Sevastapol]’. He was part of the British forces who, along with their allies, laid siege to the main Russian naval base in the Black Sea at Sebastopol. Its clear the man’s mother was concerned for his safety and anxious to keep him safe. I am sending him the blessed stones of Barrigowen [Barrigone] well inside this purse, and tell him, that if he’ll receive them, and wear them in this purse round his neck with the same faith that his own mother is sending him, please God; that he will come home safe and sound again; for any one that ever wore them blessed stones about his neck could not be harmed. I am thinking it might be better for you to pray to God to spare your son to you than to go sending these little stones; and perhaps, you or your son may lose your life by provoking him against you. Leary response is typical of a move away from, and change of attitude within, the Catholic Church from favouring devotion at holy wells to it becoming perceived as backward and superstitious. The soldier’s mother was certainly not of this opinion and according to Leary became cross and replied ‘I will send the stones at any rate, for I am sure they will do him good’. Leary, realising his arguments fell on deaf ears, and accepting her sincere conviction they would save her son ‘from Rosshen [Russian] bullets’, continued transcribing the woman’s instructions about the stones. Leary ends his letter to the Catholic Layman by noting that after sending the letter with the stones the woman also had a Mass said for her son. He seems to have more faith in the benefits of the latter. We don’t know if this poor woman ever saw her son again but I like to think these stone at least provided some comfort for him.